CHICAGO--(BUSINESS WIRE)-- Hyatt Hotels Corporation (NYSE: H) and McGough Development announced today the opening of Hyatt Regency Bloomington-Minneapolis in McGough’s Bloomington Central Station mixed-use development site near the Mall of America. 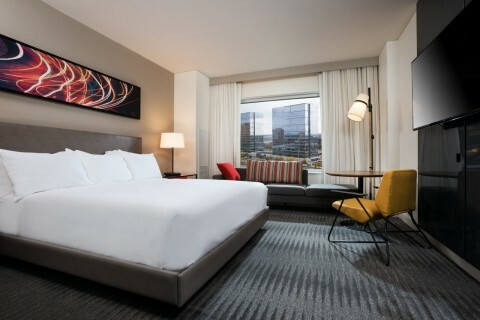 As part of the Hyatt Regency brand family, the contemporary hotel offers 303 guestrooms, including 14 suites, and is designed to foster connections and serve as a dynamic, energizing space where guests can collaborate, share and find inspiration. The hotel’s location also delivers on the contemporary expectations of guests. Hyatt Regency Bloomington-Minneapolis is one of only a few hotels in the city with access to a park and outdoor spaces for entertaining, dining and celebrating, and the Blue Line Light Rail is a quick walk through the park. “The hotel connects guests to what matters to them the most with a range of amenities for work or play, as well as spaces that make the hotel a preferred gathering space for any occasion,” said Kriewald. Hyatt Regency Bloomington-Minneapolis features 289 deluxe guestrooms. Guestrooms are designed to connect guests to all the essentials, simply and intuitively, and are equipped with the latest facilities and amenities, including the signature Hyatt Grand Bed®, a 55-inch flat screen HDTV with plug and play personal device capabilities and complimentary Wi-Fi. Deluxe guestrooms vary from two queen-sized beds or one king bed; deluxe king guestrooms offer a contemporary sitting area. The hotel also features 14 Regency Club® suites, providing exclusive access to the Regency Club lounge, which offers complimentary breakfast, all-day coffee and tea service, and evening cocktails and canapés. The hotel’s fitness facilities include the latest high-tech cardio, strength training equipment and an indoor pool. To encourage wellness, concierge services are able to provide forgotten workout gear as well as maps of local and walking paths. Urbana Craeft Kitchen & Market features locally sourced ingredients, beer and spirits. Chef Paul Lynch orchestrates a seasonal menu showcasing sustainable, regionally influenced items. The Market offers local diners, as well as guests, grab and go items or al fresco style food for picnics in the park or on the patio. The hotel’s versatility also extends to its catering service with banquet, family-style or personalized menus. With more than 15,000 square feet of multi-purpose meeting and event space, Hyatt Regency Bloomington-Minneapolis accommodates a variety of configurations. From the stylish Central Station Grand Ballroom to smaller breakout rooms, to high-tech executive boardrooms, all spaces are equipped with the latest wired and wireless technology and largest bandwidth of any hotel in the area. Whether a wedding, conference for 200 guests or an executive board meeting for 10, the hotel can accommodate the needs of any business, event planner or bride. “The hotel is key to rounding out the vision for Bloomington Central Station. We want visitors and residents to feel the sense of contemporary generosity for which the Midwest is known,” said Mark Fabel, Vice President of Development, McGough. Hyatt Regency Bloomington-Minneapolis is owned by McGough and is managed by Aimbridge Hospitality. McGough was also the builder and its project financing partners include a group of local trade union pension funds, advised by WhiteStar Advisors, LLC and Bank of the Ozarks. McGough is a premier commercial construction and full-service real estate firm headquartered in St. Paul, Minnesota with branch offices in St. Cloud, Duluth, and Rochester, Minnesota; Cedar Rapids, Iowa; Fargo, North Dakota; and Phoenix, Arizona. The company’s Bloomington Central Station development occupies 50 acres east of the Mall of America and, in addition to its existing projects and projects in progress, has a master plan that calls for 420 more residential units and two million square feet of office space in the years ahead. To learn more about McGough, visit www.mcgough.com. Hyatt Hotels Corporation, headquartered in Chicago, is a leading global hospitality company with a proud heritage of making guests feel more than welcome. Thousands of members of the Hyatt family strive to make a difference in the lives of the guests they encounter every day by providing authentic hospitality. The Company's subsidiaries develop, own, operate, manage, franchise, license or provide services to hotels, resorts, branded residences and vacation ownership properties, including under the Park Hyatt®, Grand Hyatt®, Andaz®, Hyatt Regency®, Hyatt Centric™, Hyatt®, Hyatt Place®, Hyatt House®, Hyatt Ziva™, Hyatt Zilara™, Hyatt Residence Club® and Hyatt Residences® brand names and have locations on six continents. As of December 31, 2015, the Company's worldwide portfolio consisted of 638 properties in 52 countries. For more information, please visit www.hyatt.com.